Two local thrash bands combined resources to issue a handmade disc featuring four songs from each combo. 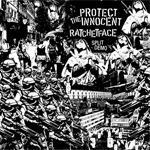 Protect the Innocent is currently on hiatus, according to their MySpace page, which reports that two of the members are apparently now in Seattle. Even when active and recording its half of this disc, the band seems more political conglomeration than musical: Their stated raison d'etre is to stop the rest of us from stuffing meat in our mouths. If you enjoy having someone scream barely intelligible lyrics about what a bad person you are for eating a cow while the drummer plays random beats and the guitarist and bass player practice their chords behind him, then this might be something you need to track down. Escondido's Ratchetface is equally at odds with the mainstream music scene, performing a loud grindcore with dual vocalists John and Jon alternately screaming and singing in a sorty of demented horror film gutteral style  and yet, they actually seem to have a game plan in place musically. The drums and guitars may be overly loud and distorted, but they're on the same page with both each other and the singing. And it's hard not to admire the enthusiasm present in their four tracks. Given more time together, the men of Ratchetface may be onto something.